Business and Leisure Travellers alike will find the Renaissance Barcelona Hotel the perfect place to explore, uncover and discover. Located in the heart of the city the newly renovated lifestyle hotel is only minutes away from famous historical sites but also surrounded by many little hidden treasures away from the mainstream tourist attractions. 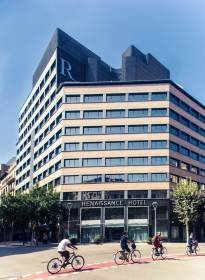 The Renaissance Barcelona Hotel has 211 contemporary guest rooms and suites with safes, flat-panel TV’s, wireless internet and luxurious bedding and 7 meeting spaces with almost 500 m2 for intimate gatherings or larger events. The hotel also feature a new outside venue the “Roof Top Bar”, which can exclusively be used exclusively for private functions or as a private Club for hotel guests and invited members.